The rules which were put in place in 2013 have cut the number of abortion clinics in Texas by half, and abortion providers said more would have been forced to close without Monday's ruling. WASHINGTON (AP) -- The Supreme Court struck down Texas' widely replicated regulation of abortion clinics Monday in the court's biggest abortion case in nearly a quarter century. The justices voted 5-3 in favor of Texas clinics that had argued the regulations were only a veiled attempt to make it harder for women to get abortions in the nation's second-most populous state. Ginsburg wrote a short opinion noting that laws like Texas' "that do little or nothing for health, but rather strew impediments to abortion, cannot survive judicial inspection" under the court's earlier abortion-rights decisions. She pointed specifically to Roe v. Wade in 1973 and Planned Parenthood v. Casey in 1992. Thomas wrote that the decision "exemplifies the court's troubling tendency 'to bend the rules when any effort to limit abortion, or even to speak in opposition to abortion, is at issue.'" Thomas was quoting an earlier abortion dissent from Justice Antonin Scalia, who died in February. Scalia has not yet been replaced, so only eight justices voted. Alito, reading a summary of his dissent in court, said the clinics should have lost on technical, procedural grounds. Alito said the court was adopting a rule of, "If at first you don't succeed, sue, sue again." Abortion providers said the rules would have cut the number of abortion clinics in Texas by three-fourths if they had been allowed to take full effect. Texas Attorney General Ken Paxton said the law "was an effort to improve minimum safety standards and ensure capable care for Texas women. It's exceedingly unfortunate that the court has taken the ability to protect women's health out of the hands of Texas citizens and their duly elected representatives." Nancy Northup, president of the Center for Reproductive Rights, which represented the clinics, said, "The Supreme Court sent a loud and clear message that politicians cannot use deceptive means to shut down abortion clinics." Democratic presidential candidate Hillary Clinton called the decision "a victory for women in Texas and across America." Texas is among 10 states with similar admitting-privileges requirements, according to the Center for Reproductive Rights. The requirement is in effect in most of Texas, Missouri, North Dakota and Tennessee. It is on hold in Alabama, Kansas, Louisiana, Mississippi, Oklahoma and Wisconsin. The hospital-like outpatient surgery standards are in place in Michigan, Missouri, Pennsylvania and Virginia, and it is blocked in Tennessee and Texas, according to the center. 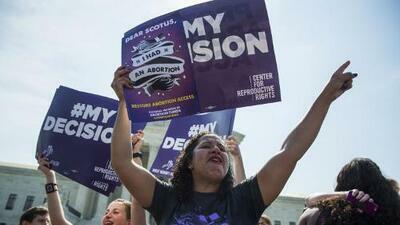 Texas passed a broad bill imposing several abortion restrictions in 2013. Texas clinics sued immediately to block it, contending it impermissibly interfered with a woman's constitutional right to an abortion. The clinics won several favorable rulings in a federal district court in Texas. But each time, the New Orleans-based 5th U.S. Circuit Court of Appeals sided with the state, at first allowing challenged provisions to take effect and then upholding the law with only slight exceptions. The Supreme Court had allowed the admitting-privileges requirement to take effect in most of the state, but put the surgical center provision on hold pending the court's resolution of the case. The justices split largely along liberal-conservative lines in their emergency orders, with the court's conservative justices voting repeatedly to let the law be enforced. A separate appeal is pending at the Supreme Court from Wisconsin, where federal judges have struck down that state's admitting-privileges law.